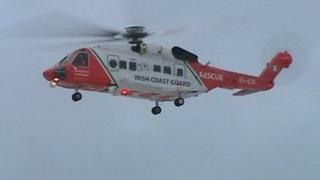 A man who died when a boat capsized off the Irish coast leaving 10 people in the water for hours has been named. Francis Smith, 72, of Salisbury in Wiltshire, was sailing off the County Wexford coast in the Republic of Ireland when the incident happened. A Garda police spokesman said a post-mortem examination had taken place at University Hospital Waterford. The alarm was raised on Saturday at about 23:30 when the boat failed to return to shore. It is understood a woman and nine males, including a teenage boy, were wearing life-jackets and ended up in the water for up to five hours before being rescued. Mr Smith was picked up by the Irish coastguard helicopter and taken to University Hospital in Waterford where he was later pronounced dead. The other nine people were taken by road to Wexford General Hospital.